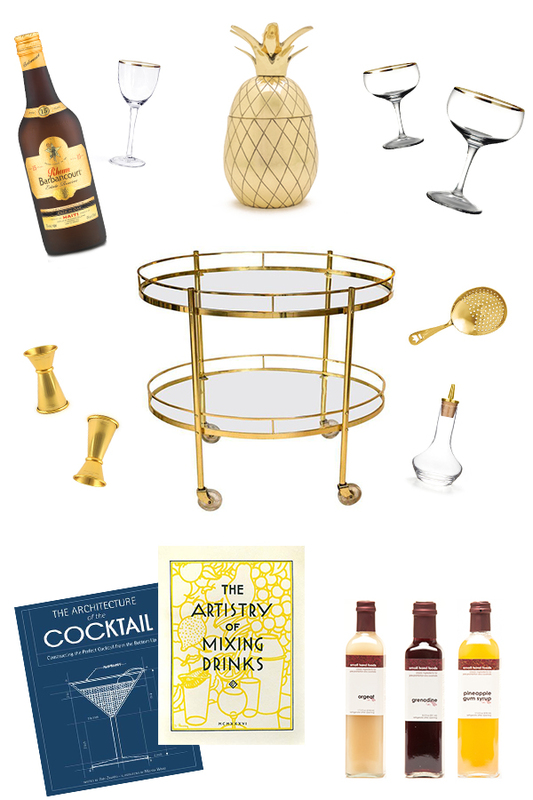 There's one thing my mother-in-law and I are always on the hunt for: the perfect bar cart. It must be well-proportioned, the right shade of brass, and hold enough bottles to make it a practical. Anyone who's gotten a peek at our liquor cabinet understands this particular dilemma. When I spotted the Mid-Century Brass Bar Cart at Chairish, I was hooked–the classic oval cart fashioned out of solid brass and mirror glass was a dream! And though the price tag might be a bit steep for a graduate student's budget, I've pulled together some accessories that will make any place feel like your favorite retro watering hole–starting with that amazing pineapple tumbler from W&P Designs! As far as I'm concerned, every bar needs a really lovely rum, plenty of chilled coupe glasses for daiquiris, and vintage cocktail books, as much for inspiration as for the recipes themselves. Tell me, what does your bar need?